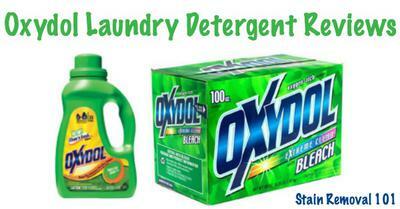 Shepherd has shared a short review of Oxydol laundry detergent. I have 9 children and I have been using Oxydol to wash their clothes for 3 years now. I love the smell and it does an awesome job at removing stains. I have been using the "Smells Good" scent and wouldn't buy anything else. Thanks for your review of this laundry detergent. Wow, with 9 kids I bet you have to do a lot of laundry. One of the good things about Oxydol is that it is lower in cost than many name brand detergents. Of course, it is not easy to find online cheap, but instead I have noted it is available only in certain stores. I have found that is available at both Meijer and Dollar General, typically, along with many more regional supermarkets. I would love to hear from even more people, sharing what you think about this detergent. You can share your laundry detergent review here for this, or any other brand, telling me what you like or don't about it, and why. I am especially interested in hearing how other lower costs varieties of detergent work, since if they work just as well there is no need to buy something that costs more, right? I use Oxydol liquid with BIZ already contained in the detergent for washing my son's sports uniforms, currently football. I can remember my grandmother using Oxydol powder and since I was already a fan of the BIZ product for removing stains I gravitated to the latest form of this detergent which contains it. For washing his uniforms I follow the approach of soaking with the regular BIZ, then washing with the Oxydol that has the BIZ additive. This detergent is a lot cheaper than using the other more popular brands. I normally find this at one of the Dollar stores, though it sells for about $3-4. As I am not one for using detergents that contain perfume for the general wash I normally do not use Oxydol for the rest of my laundry, however if I am running a separate load for my son and there are heavy soil or stains, e.g. food stains on shirts, I will use it. My sister's son works in a restaurant and she uses it to wash his uniforms. It is excellent both as a whitener and stain remover. She said that it is especially nice to have a detergent that does so much for such a small price. Thanks for this review Maria. I have now heard from two readers saying that this detergent has BIZ added to it, but I have never actually seen confirmation of this on the Oxydol website (which apparently appears to be quite poor, with lots of broken links, etc). I did see they had a partnership between the two brands though, so I guess this shouldn't surprise me. If you've used this laundry soap, please tell me what you think of it, and also where you can find it in stores! You can share your review here and I'll add it to the site. It Gets Out All Kinds Of Tough Stains! 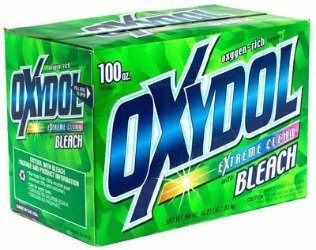 When it comes to laundering uniforms, whether they are factory, restaurant, soccer, baseball, or football, I reach for the Oxydol. It is the cheapest and most effective detergent I have found to tackle really tough dirt and stains like grass, blood, coffee, egg based, fruit, and vegetables. I have also used it to remove old red drink stains from a white table cloth by presoaking over night. If you have kids then you definitely have lots of laundry stains. I have used Oxydol to remove grass, mud, food, and drink stains. It also is great at taking out odors like perspiration from smelly gym clothes. I prefer the powder form which I use to soak stained clothes prior to washing. There is no better approach than soaking heavily stained clothes over night because the real work is being done while I am resting. My friend works at a day care center and gets various stains on her work clothes like formula, baby food, etc. She also soaks her clothes in Oxydol and has good results, but she said that for the same stains on baby clothes Oxydol would not be the way to go since babies have much more sensitive skin than adults. She noted that Borax and Oxi Baby (an Oxi Clean product) powders are good for soaking baby clothes and Lestoil works well on peanut butter. To be honest I did not think that Oxydol was still available as it was something my grandmother used. When I started working as a desk clerk at a hotel where white shirts were required every day I discovered it was still around. One of the workers at the restaurant told me if I wanted an inexpensive way to keep my shirts really white I should get some Oxydol powder and do a 30 minute soak before washing. She also said it was excellent in getting out all kinds of stains on her white uniforms, as well as grass stains from her son's clothes. While my job does not cause the amount of stains she has to deal with I have gotten out the occasional coffee and soft drink stains and it is definitely terrific at keeping my shirts a bright white, without the separate addition of any type of additional bleach to the wash.
BTW for stains it really helps if you mix up a paste of the Oxydol and apply it directly to the stain, leaving it on just long enough that it does not dry before dropping it in the washer, unless you prefer to do a soak longer than 30 minutes. Both the front of the bottle, and also on the back where the various ingredients are listed, it shows that Biz is included. I have only been able to purchase the 50 oz bottle in my area, but I believe they do make a 100 oz size as well. I do agree that their website could be a bit clearer. Hard To Find In Stores Now: Where Can I Buy It? I have been using Oxydol for over 50 years and still feel it is the best laundry detergent. Other detergents cause rash and itching but we have no problems with this brand. However, I am finding it harder and harder to find Oxydol in the stores. I have checked all the major grocers with no success. I did find some at Big Lots once but when I went for more, they no longer had it. Can you refer me to an Oxydol merchant in the Tacoma, Washington area? You're right Joanne, it is getting hard to find this laundry soap in stores. I personally recently noticed it in my Walmart, at least the powder version, and I have also seen it in a couple of dollar stores (but the exact one right now escapes me). I'd love for readers to tell me where they've seen it anywhere, not just in Washington, to help people that want to buy it know where they can look! Amy shared that she has been washing her daughter's restaurant uniforms, and the restaurant manager suggested Lestoil and BIZ for stain removal. She also shared that a good detergent was also needed, and explained why she was using this low-cost detergent for the uniforms. Since I now have a lot of messy (smelly) uniforms to wash I use Oxydol for these garments, since it has some oxygen bleach included in it. This laundry soap is a bit more economical than other detergents. Although I don't like scented detergents it is fine for her uniforms. They come out really clean and smell fresh with this approach. Thanks Amy for this quick review of this product. I would love to hear from even more people who've used it, sharing how it works for them, and also where you've purchased it, since it isn't found everywhere. You can share your review or experience with it here. I make my own most of the time but this brand is also AWESOME!! Gets every kind of stain out. Whenever we stayed at my grandmother's house she would use Fels Naptha to pretreat stains on our clothes and then presoak/wash them with Oxydol powder. We got pretty dirty (grass, mud, and ice cream) but she got our clothes clean. Of course she always had us help with the chores, that is why I know what she used for the laundry. To this day I use both of these products to tackle tough laundry stains. For laundering uniforms, either the ones I wear to the restaurant or my son's football uniforms I prefer Oxydol, but if I can't find it readily available I will use ERA OXI. In either case soaking overnight produces the best results for the stains on my uniforms and the major dirt and stains on his. ERA is a bit more expensive than Oxydol, but works well for the uniform problems. I've been using Oxydol for some time now, and the stores I bought at has discontinued selling it. I'm so sad, had I known I would have stocked up. Family $ store. Dollar Tree for $1, very watered down but works good. Great at removing the stains and smells from uniforms worn at the day care center,like spit ups and baby food. It also is good for laundering workout clothes. Presoaking is the best way to handle these loads. It is also very reasonable compared to other detergents. I prefer the powdered form of this detergent, as it just does a better job on protein type stains like formula. I love this product. When I moved from Kansas City to south Florida, I could no longer find Oxydol Powder with Biz in the stores. I emailed Oxydol customer service and found out it's not available in Florida but is available online. When using Oxydol with Biz I find no need to add Biz or fabric softener. My clothes come out clean, stain free and soft. My next trip home, I'll be stocking up and bringing back several boxes. For clothes that really are clean, stain free and smell good, I've never found a product that works as well. I just tackled several loads of very stained and dirty camp clothes using a combination of presoaking and washing with Oxydol and Biz powders. These clothes were stained with mud, blood, tomato sauce, perspiration, and a number of things I could not even identify! I think one of the camp counselors for telling me about using both of these products together. I was already a Biz user but had not tried Oxydol. Talk about clean and fresh smelling, yes to both of those accounts. I would recommend this team to anyone who has lots of stained and really dirty laundry, especially when the stains are many days old. I had never ever even heard of Oxydol in my life. I have used tide, gain, arm & hammer for my laundry. I but Purex or dollar detergents to scrub my deck. So I do not like Purex.Tide is getting ridiculous pricey and Gain is OK.
Oxydol was on sale at my local grocery store and it's the first time I see it there, for $7.99. I am using my last "backup" tide so am looking to buy more detergent. Being curious, I googled it. Amazon gave it solid 5 star with 9 reviews and then I came across this page. I read all the reviews and decided to buy it. Just bought today. Two loads so far and I have a he washer. I have to tell you, there is no "sour" unclean smell. And clothes looks and feel clean like using tide!!! I live in Canada and used Oxydol faithfully until it was no longer available here, about 20-25 years ago. No other laundry soap comes close in smell, stain removal or excellence in cleaning laundry. Then I found this site and read it is sold in the DollarTree stores, which we have here, so going there soon and hoping I'm successful! So glad I found you! I will say this and this only. The very best way to get clothes very white is with hot water and original 1 cup formula Oxydol, for now they actually have it at the dollar store. Recently I bought a great big box of Tide with bleach for half price clearance, people swear by it for whites, but I find it leaves a little dirt on the socks like Oxydol does not, the same way it was back in the 80s. 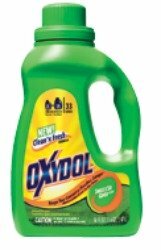 People ranted and raved about new tide with bleach, how great it was, but I always found Oxydol to be a little better. The tide with bleach was not bad, but not really white like Oxydol gets them. Oxydol no longer dyes its bleach green, but rest assured what you are buying IS original Oxydol. Wash in as hot water as you can and don't worry about oversudsing, as Oxydol rinses out so good, and is so gentle on skin, cleans without harsh ingredients of today's detergents. No matter what scent you get, your clothes will smell unscented clean. I cannot vouch for it on colors, I always used Cheer powder on colored clothes until it was not he, then it did not matter, one liquid was the same as the other. Proved that today. There were embarrassing grease stains on pants and a shirt on my line, and I brought them in, rewashed in cheer powder before was all oxi and voila cheer got all the dirt out like magic and in the coldest waters cheer works too. I really like the Oxydol powder for soaking and washing my restaurant uniforms. Presoaking became a regular habit when I started the restaurant job. What a difference presoaking makes. It is super at getting out stains and is an excellent whitener. Since most stores do not carry it sometimes I substitute Gain Powder. Gain is available in most stores and there are frequent coupons and sales to offset the normal higher price. I generally do not like scented detergents but when it comes to my uniforms it is worth ir. A co worker suggested it and she was right. She has 2 kids so her laundry problems are not just her uniforms but also other stains like grass, blood, grimy socks, etc. For grease stains, cooking oil, salad dressing, etc. we all use Lestoil. I'm from a family of 7 kids. Our father farmed 500 acres and us kids were always in dirt and in the fields helping. Not only did Mom wash our clothes with Oxydol, we washed our hair in Oxydol. Sometimes we'd rinse our hair with vinegar, than Downey fabric softener. I remember my hair was really soft and shiny. Mom and us girls got lots of compliments about our hair. I didn't realize it was still around. Also our clothes were always clean and smelled good too. I'm going to start using it for my laundry. Glad I ran across this site. I only discovered Oxydol with Biz a few months ago, and have been buying the powder version through Amazon. This is hands down the best laundry detergent on the market. I've been trying like heck to get my local grocery store to carry it! Works great on oils and stains, smells wonderful, and really rinses clean. I love it! Was using Tide®, but cost is just getting too out of control. Oxydol costs half the price, but yet, have no problems with its cleaning ability. Have never looked back at Tide again. There is no excuse for using Tide. Tide is a good detergent, but is way too much $$$.